Early coverage of classes and objects. We believe that students must first be client users of objects before they can appreciate the difficulties of designing flexible, usable objects. All proficient designers started as users. We first use standard stream class objects, such as cout and cin, string objects using the Standard Template Library, and a limited number of objects derived from a graphical library developed for the textbook. This experience helps reinforce the concepts of encapsulation, software reuse, and the object-oriented programming paradigm. Broad coverage of the adopted C++ standard. The coverage reflects the important additions and modifications to the language, such as the type bool, Standard Template Library, namespaces, and exceptions. Because we recognize that some compilers do not yet reflect the standard, aside boxes are used to highlight changes with the past and offer alternative implementations. Integrated use of the Standard Template Library (STL). The STL with its rich collection of container classes for representing lists and strings and its generic algorithms is going to change the way programmers develop software. We extensively explore the string and vector classes. Extensive coverage of classes. More than fifty classes are designed and developed. Software engineering concepts are introduced using problems and software projects. Real world examples are drawn from many varied areas such as science, business, engineering, humanities, mathematics, recreation, etc. We present the use of a graphical Application Programmer Interface (API) designed specifically for beginning programmers to develop interesting programs. An API is provided on CDROM to support the software projects in the book. The API is a portable, object-oriented graphical library, named EzWindows, for the easy display of simple geometric, bitmap, and text objects. We supply implementations of the API for popular Windows and UNIX compilers. The API allows students to easily design and implement exciting programs while learning the fundamentals of programming. The CDROM also provides most of the code presented in the book. Friendly pedagogy, self-check exercises, and numerous homework exercises. 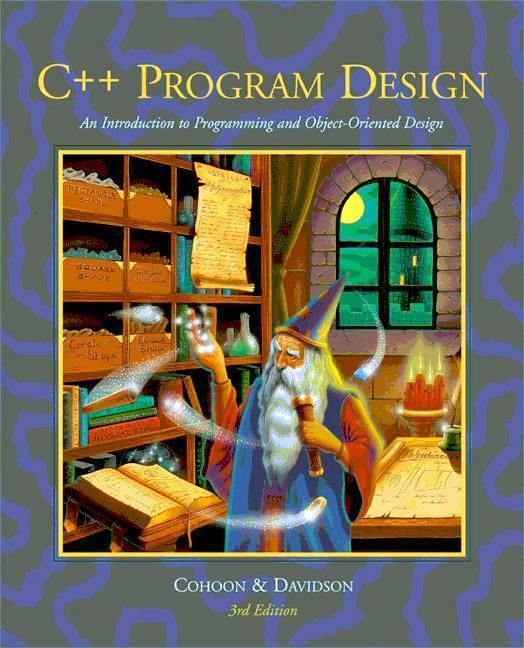 The text also includes style tips, programming boxes, warning boxes, historical notes, and other guides to learning C++ and program design. The exercises span the gamut of quick tests of fundamental concepts to short programming assignments to final projects.